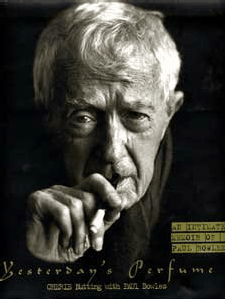 In Yesterday’s Perfume, Cherie Nutting recounts her relationship with the famed author and composer Paul Bowles through photography and text, in an attractive edition published by Clarkson Potter. Presented as a journal and divided into three main sections, the book begins with Nutting’s description of her first trip to Morocco as a child in 1960. Those indelible impressions are the impetus for the author’s return ten years later, and many visits thereafter. Deeply moved by The Sheltering Sky, Bowles’ most famous work, Nutting writes him a long, heartfelt letter, and he subsequently invites her to come to Tangier, where he has lived since the late forties. So in 1986, Nutting crosses the ocean once more, this time to meet the man who has “become my only hero.” Their meeting begins a complex thread that forever alters the course and fabric of her life. While their friendship continues to develop in the book’s second section, Nutting’s experiences also are informed by her interactions with the Moroccans, Europeans and Americans in Bowles’s orbit, among them the composer Phillip Ramey; the Chilean painter Claudio Bravo; Claude Nathalie Thomas, who translates Bowles’ works into French; the Rolling Stones and Donovan; and Bernardo Bertolucci, who directs the film version of The Sheltering Sky. Perhaps her most telling meeting is with Mohammed Mrabet, a Moroccan author whose published oral tales are transcribed and translated by Bowles. A chronic imbroglio between Nutting and Mrabet ensues in regard to a house he is building for her—a cautionary tale that weaves its way throughout this middle section as an intriguing subtext. Nutting also introduces Bachir Attar, leader of the Master Musicians of Jajouka, whom she eventually marries and, through recording contracts and concert tours, assists in carrying the powerful Jajouka music to an international audience. Throughout, Nutting’s photography captures the varied people and locales of Morocco (as do the images of Peter Beard, Bruce Weber, and others). Her camera work catches many of the details that surround Bowles’s daily existence: the closet full of perfumes, his kif box, a bonbonnière, rings, knives, a small toy from Kyoto for Jane Bowles (his late wife and accomplished author in her own right). Wisely, the Nutting vignettes she intersperses among the photographs do not attempt to deconstruct the essence of Bowles’s craft. Instead, she provides a generous amount of previously unpublished text by Bowles on a wide variety of topics: the Hotel Continental, the oldest in Tangier; Cherifa, whose sorcery may have led to Jane’s death; a story called ‘The Passport;’ essays on Tangier, cats and the difficulties of being interviewed; and epigrams about various of his friends. In so doing, she allows those readers unfamiliar with Bowles’s writing to sample the richly inventive imagination and lapidary style that place him within the pantheon of twentieth-century American authors. Yesterday’s Perfume also includes several tributes from others who knew the expatriate author well: composer Ned Rorem, who comments on Bowles’ significant contributions to music; Jeffrey Miller, his bibliographer and editor of his letters; and Rodrigo Rey Rosa, his gifted Guatemalan protégé. Rey Rosa’s elegant tribute leads us into the final section of the book and the twilight of Bowles’s life, describing how Bowles moved in opposite temporal directions at the same time: while he aged chronologically, he also continually traveled to the distant past, thus combining the wisdom of maturity with the vigor and inquisitiveness of youth. Rey Rosa’s notion of time travel is appropriate within the broad context of Yesterday’s Perfume. In one fragment of the Bowles short story “Things Gone and Things Still Here” (also one of Nutting’s chapter titles), the narrator describes how certain individuals come upon a crack in time and fall in. The traveler eventually returns to the world with either wisdom or loss—perhaps both—but always the entry into this “bubble in time is decisive.” Nutting’s extended sojourn within the Bowlesian time zone indeed proves decisive, for it enables her to emerge with a tribute wherein the artistry of the author and her subject serves as a bright corona around a deep friendship depicted with candor and emotion. Originally published in Volume 6, No. 1, Spring 2001 issue of the Rain Taxi Literary Review.